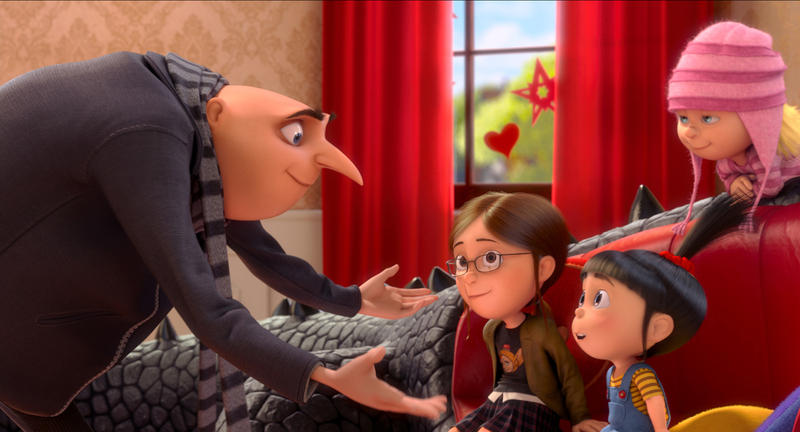 (L to R) Gru (STEVE CARELL) has a family meeting with Margo (MIRANDA COSGROVE), Edith (DANA GAIER) and Agnes (ELSIE FISHER) in “Despicable Me 2.” ©Universal Studios. HOLLYWOOD—At 20, Miranda Cosgrove has been acting for more than half her life. But don’t confuse her with so many of the other child performers who have gone astray. You’re not likely to see Cosgrove, who most notably starred in the kid-friendly Nickelodeon series “iCarly” for six years, getting arrested or hanging out at Hollywood nightclubs. Right now, the veteran actress is enrolled at the University of Southern California’s film school, hoping to hone her screenwriting skills in order to continue her career. Polite and poised, the brunette Angeleno is focused on the next phase of her life, now that her popular TV series wrapped at the end of 2012. In the family-friendly sequel from Universal Pictures and Illumination Entertainment, Gru, is settling into fatherhood with his adorable three adopted daughters and trying to establish a legitimate canning business when he is called upon by a secret government agency to track down a dastardly criminal who has carried out a major heist and has evil designs on transforming the beloved minions into monsters. Meantime, Margo’s budding affections for the good-looking but aloof son of a restaurant owner concerns the overprotective Gru, and complicates his efforts to track down the criminal. “Saturday Night Live’s” Kristen Wiig joins the voice cast as a spy that recruits Gru and Benjamin Bratt plays restaurateur Eduardo who may also be a master criminal named El Macho. Dressed in a summery black halter dress, Cosgrove spoke about her latest film role, saying goodbye to “iCarly” and what’s ahead. Q: Was it easy to fall back into the voice of Margo after three years? Cosgrove: Yeah. I didn’t know a lot about animation when I started the first movie but this time, because it’s a lot of the same characters and some cool new characters too, working with the same directors and everyone on the team, it was a lot of fun. So it was a little easier because I know everyone better now. We improvised more and had more fun with it. Q: Are you glad your character gets a boyfriend in this and did you feel it was accurate to your memory of young teen dating? Cosgrove: I definitely thought about being in fifth grade and the first time that I ever really liked somebody. I remember the way you feel when you can’t even string a sentence together so it was fun being able to be Margo and being a little older (than the first movie). She’s not as protective of her sisters because now she trusts Gru a lot more and they’re more of a family. Cosgrove: Yes. I would just go in and record, sometimes on the weekends or times when I had off from the show. I went in a few times after we finished the series and I just saw it for the first time in Australia (at the “Despicable Me 2” premiere). Q: How do you feel now that the TV series is over? Do you feel like you’ve closed a chapter in your life and are moving on to the next one? Cosgrove: I do feel that way in a lot of ways because I really grew up making that show and I hung out with the cast, which is a pretty small cast, every day for almost six years. I definitely miss it in some ways but in other ways I’m excited that people who liked that show can see this. It’s something new and fun so the families that watched “iCarly” will enjoy this. Q: You’re at such an interesting juncture where you have projects like this and college going on. How is that going for you? Cosgrove: In a lot of ways, I feel like a lot of my friends who are in college and trying to figure out what they want to major in and what they want to do. I definitely want to act but at the same time I feel like college is awesome because I want to learn about a bunch of new things that I’ve never tried before. I even took an art class that was really fun. I definitely feel lucky that I can do a lot of different things because I like doing a lot of different types of things. Even with voiceover acting, it’s so different than being on a TV show or a movie. It’s fun. Q: Is there anything tempting you away from acting? Cosgrove: I think even with college, the reason I want to go so badly is so that I can major in film. I wanted to take screenwriting classes and learn more about behind the scenes stuff. I love people like Steve Carell and Kristen Wiig, who both write a bunch of their own material and are so involved in everything they do. That’s really why I wanted to go. Q: You obviously had a big fan base before this movie, how did the character change your fandom? Cosgrove: I think it’s funny because a lot of little kids have thought in the past that I actually am Carly because they think the characters are real. I think it’s kind of similar in animation. When Steve and I were in Australia (promoting the movie), a lot of the younger kids were really shocked that there are people behind the animated characters. When Steve did the Gru voice for all of them, their minds were blown. It’s funny to see how kids totally think things are real. Q: Did you get to work in a booth with anyone else or did you record your dialogue by yourself? Also, did you work with Moises Arias (who plays her love interest Antonio) or talk with him about the role? Cosgrove: It’s kind of funny because my friend is good friends with him and I never met him while we were doing the movie but recently I went over to my friend’s house to play games and he was there and said, “I’m like the suave, cool guy in ‘Despicable Me 2,” and I was like, “No way. That’s awesome. I had no idea.” I know him now and I’m sure he’s going to be at the (Hollywood) premiere and stuff, but we all did our recording individually. Q: I see a lot of you in the Margo character. Were you filmed so the animators could incorporate your facial movements and gestures into the character? Q: The minions were the breakout of the first movie. Were you surprised and did you fall in love with them the same way the public has? Cosgrove: I definitely love the minions. I think they’re really cute. I’ve been with a lot of minions in real life and seen a lot of people in minion outfits for the past few weeks. They dance a lot. I just saw one today in the hallway. I pressed the elevator button and when the elevator door opened, there was one sitting in there and I got in next to it. Q: One of the funny sight gags in the movie was the edible sombrero hat with guacamole in it. Q: Margo is really into texting when her father is trying to talk to her. Do you text as much as she does or do you try and pay attention to the person you’re with? Cosgrove: I do text a lot. I don’t know. Sometimes at night my thumbs hurt because I text too much. I try harder now to pay attention to my mom when she’s talking to me because now I’ve learned to answer what she’s saying without actually listening. I try harder now to actually pay attention to what’s going on. Q: When you watch this, can you and your friends see you? Q: You’ve signed on to the NBC TV pilot “Girlfriend in a Coma.” What’s the status of the series? Cosgrove: We haven’t shot the pilot of anything yet, so I’m just waiting to find out. Q: Have you met with Christina Ricci (who plays her mom) and the writer (“Nurse Jackie” creator Liz Brixius)? Cosgrove: Yeah, when we did the original table read. Q: What attracted you to that role? Cosgrove: It’s cool because it’s a dark comedy, and it’s different from anything I’ve done before. I really like that about it.